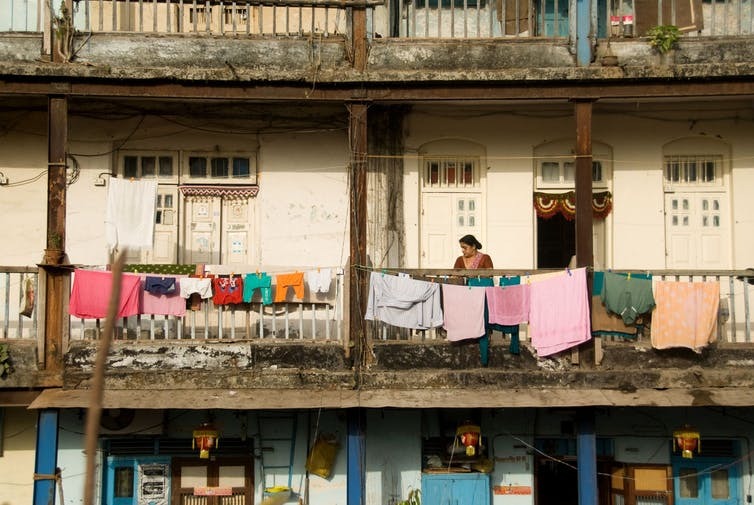 Part of Mumbai’s character is in its chawls, which could soon become history with the state government’s push to replace them with high-rise towers. In 2014, the new Indian government declared its intention to achieve 100 smart cities. In promoting this objective, it gave the example of a large development in the island city of Mumbai, Bhendi Bazaar. There, 3-5 storey housing would be replaced with towers of between 40 to 60 storeys to increase density. This has come to be known as “vertical with a vengeance”. We have obtained details of the proposed project from the developer and the municipal authorities. Using an extended urban metabolism model, which measures the impacts of the built environment, we have assessed its overall impact. We determined how the flows of materials and energy will change as a result of the redevelopment. Our research shows that the proposal is neither smart nor sustainable. The Indian government clearly defined what they meant with “smart”. Over half of the 11 objectives were environmental and main components of the metabolism of a city. These include adequate water and sanitation, assured electricity, efficient transport, reduced air pollution and resource depletion, and sustainability. We collected data from various primary and secondary sources. This included physical surveys during site visits, local government agencies, non-governmental organisations, the construction industry and research. We then made three-dimensional models of the existing and proposed developments to establish morphological changes, including building heights, street widths, parking provision, roof areas, open space, landscaping and other aspects of built form. Demographic changes (population density, total population) were based on census data, the developer’s calculations and an assessment of available space. Such information about the magnitude of the development and the associated population changes allowed us to analyse the additional resources required as well as the environmental impact. India’s plan to build smart cities by replacing current housing with high-rise towers is neither smart nor sustainable. In order to compare the environmental impact of the new development with the existing housing, it is useful to measure it in terms of changes per capita or unit of floor area. 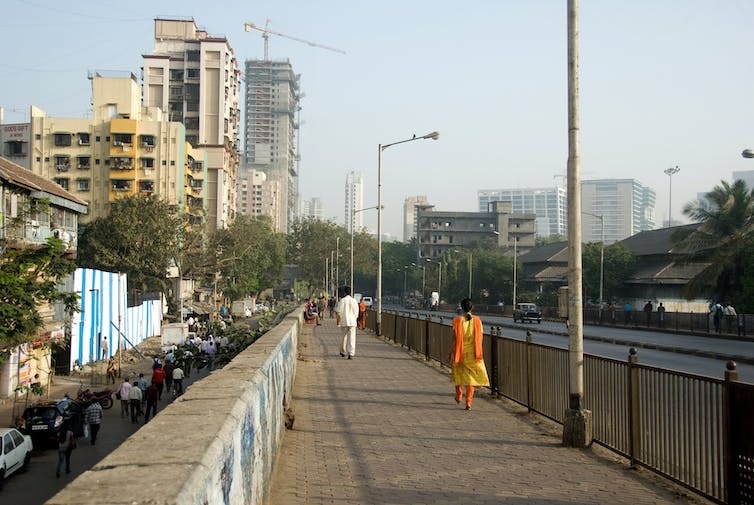 The redevelopment of Bhendi Bazaar would result in a population increase of about 25%. Our research indicates that metabolism does not increase linearly (on a per capita basis) with density, but accelerates instead. Water consumption and waste water production per capita is likely to increase by 155%, largely because of the potential for more appliances and bathrooms in the towers. Rainwater harvesting, a compulsory requirement, is likely to reduce to less than half (45%) as the roof catchment area of towers is smaller than that of the existing housing. Residential electricity consumption per capita is predicted to increase by 30%. In commercial and retail spaces, electricity use will more than double per unit of floor area (226% increase). This is primarily because of the increased requirement for air conditioning in the towers, but also because of the need for more lighting, ventilation pumping and lifts in the common areas and basements. Carbon dioxide emissions more than double as electricity consumption increases, resulting in a 43% increase in per capita emissions. However, emissions from transport increase by 176% per capita because the development leads to more private car ownership, with 3,000 car spaces where there were none before. All this is happening is a city that already rations water to a few hours per day and where electricity blackouts are common because of insufficient supply. Only about 20% of sewage is treated. The rest discharges into the Arabian Sea. Landfill sites have already outlived their carrying capacity. The quest to make cities smart and liveable has been promoted alongside increased population densities and urban compaction. We argue that this planning goal is reaching a point where resources are inadequate for the functioning of a city. Case studies such as Bhendi Bazaar provide an example of plans for increased density and urban regeneration. However, they do not offer an answer to the challenge of limited infrastructure to support the resource requirements of such developments. The results of our research indicate significant adverse impacts on the environment. They show that the metabolism increases at a greater rate than the population grows. On this basis, this proposed development for Mumbai, or the other 99 cities, should not be called smart or sustainable. With policies that aim to prevent urban sprawl, cities will inevitably grow vertically. But with high-rise housing comes dependence on centralised flows of energy, water supplies and waste disposal. Dependency in turn leads to vulnerability and insecurity. Suburbia offers some buffer. Water and power can be collected from individual roofs and food produced in individual gardens. However, we argue that vertical urban form on this scale offers little resilience.